My alarm went off at 3:40am to prepare for the sunrise tour of Tikal that left our hotel, the Tikal Inn, at 4:00am. However, when I rolled over to shut off my alarm, I realized that it was pouring buckets out. I got up and put my contacts in while Lindsay’s alarm went off about 10 minutes later. We decided to skip the tour because of the rain. It broke my heart a bit because I was hoping to see an amazing sunrise over the tops of the temples and capture them on my camera. But, alas, I will have to do it another time. The downfalls of traveling in the almost official rainy season. The park officially opens to normal tourists at 6:00am so we went back to sleep for a couple more hours. The sounds of the rain and the jungle coupled with travel exhaustion from the previous two days led to a great night’s sleep. We soon set out on the short walk from the hotel to the trail entrance where we paid another Q150 to enter the park. If we had waited and not used our ticket from yesterday then we could have saved Q150. Personally, it was worth the expense in my opinion. Instead of wandering around the trails and taking the long way to the Grand Plaza like the day before, we took the direct trail right to the Grand Plaza. As we started walking up the trail we suddenly heard this racket. It sounded like a mix of dying cows and mating gorillas. Not that I know what that sounds like… We both looked at each other and all I could think of was we were on the Lost island with the polar bear! Actually, it was a group of howler monkeys! Unfortunately, we could not see them from the trail. They carried on for at least an hour as we wandering around the Grand Plaza. Around 8:00am Lindsay and I headed back towards our Hotel for breakfast and packing. Our taxi was arriving to pick us up at 10:00am. Breakfast at the hotel was delicious. I had the pancakes with fresh fruit and papaya juice. Our taxi driver arrived sharply at 10:00am and we were off for our 2 hour nerve-wrecking drive from Tikal National Park to the border of Guatemala (Melchor de Mencos) and Belize. Getting over the border was fun. There was some confusion between our Spanish-speaking driver and our limited Spanish-speaking abilities. He pulled over and locked our packs in his car while he went to look for his amigo on the Belize side to drive us to San Ignacio. Lindsay and I went through the Guatemala border crossing/customs, which is just a line at a desk. We paid our $3 USD departure tax and got our passports stamped. We were done in less than 5 minutes and spent about 25 minutes looking for our driver. Finally he came back and told us it would cost about $25 USD each for his amigo to drive us from the border to San Ignacio. We told him no and that we would find our way. I gave him a $2 USD tip and we grabbed our bags and went through Belize’s border crossing. Again, super easy. 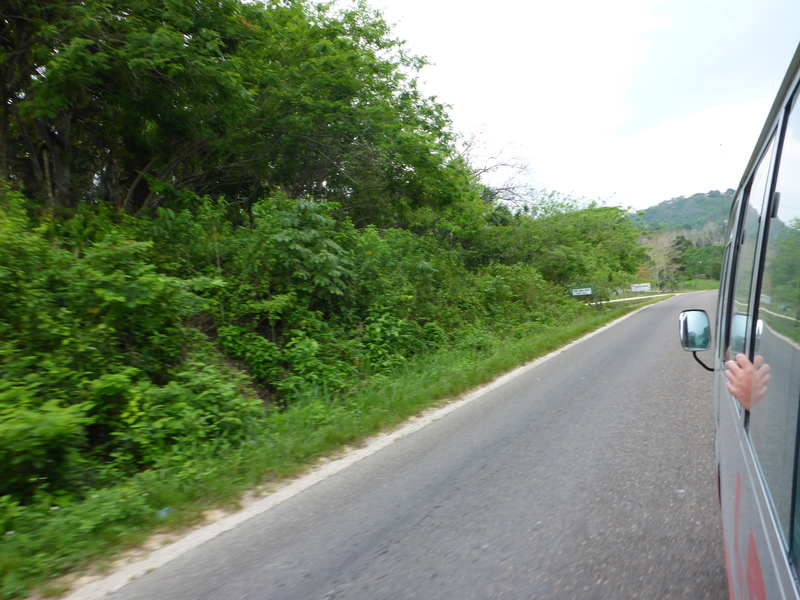 We got a taxi for $5 USD from the border to Benque Viejo del Carmen, the closest Belize town to the border (about 2 miles away). He dropped us off at the “bus station,” which is really just a stop in front of a shop. 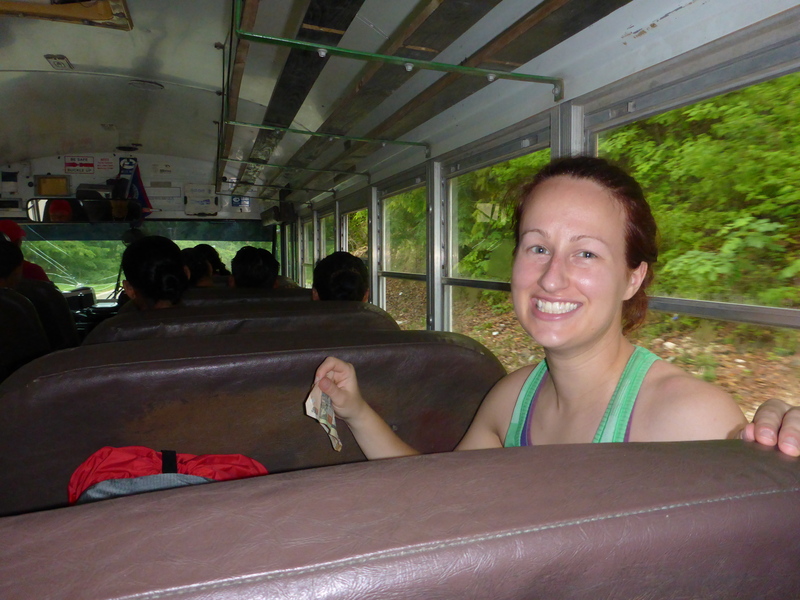 We hopped on the old yellow school bus for the 1 hour or so ride to Belmopan. The bus ride cost us $2.50 USD each. WAY cheaper than the $25 each taxi ride! The bus stopped every once in a while to pick people up and drop them off, but it moved quicker than I thought it would. The bus dropped us off at the main bus station. Happy to ride the $2.50 USD bus from Benque to Belmopan! Once we were off the bus we headed straight to Scotiabank to get more cash. I was a complete idiot when budgeting my cash. I had budgeted $325 in cash based on my last trip to Central America (Costa Rica and Nicaragua), but I forgot that everything except dinner was pre-paid. I only brought my credit card so I had to take a cash advance, which cost me a few extra at the end. So make sure you either bring your debt card or enough cash! Lesson learned. We had time before the guide from the cave tubing company was going to pick us up at the bus station. We grabbed a quick dinner at Caladium Restaurant across from the bus station. We both had the special – jerk chicken, coconut milk rice and beans, and fried plantains. The rice and beans were to die for. I wanted just a plate of that! Walter, our guide from Cave Tubing Belize, met us at the bus station right on time and we drove in the van to their headquarters at Cave Branch located at Mile 37 on the Western Highway. After paying $75 USD each for our 2-person tour (which includes the tour, all the gear, dinner, rum punch, and transportation from Belmopan to Belize City), we hopped in the van for the 10 minute drive down the road to the river. I will have a separate post next week on just our cave tubing experience. But, I will say, if you are ever in Belize you NEED to go cave tubing! And go with Cave Tubing Belize. They are the best! Our cave tubing adventure took a few hours and it was absolutely amazing. Worth every penny in my mind and I would do it again in a heartbeat! After the cave tubing we changed and hopped in a brand new truck with Vitalino Junior. Honestly, I think the ride was one of the highlights of the trip. Junior told us a lot of the country and culture of Belize and also about his life. They gave us our dinners to-go with rum punch in sippy cups. Over the hour and 15 minutes of the drive back to Belize City, I succeed to get quite tipsy! That stuff was good! Junior dropped us off at the Sea Breeze Guesthouse. I had made the reservations prior to leaving the states. The hostel came recommended by Lonely Planet and it was one of the cheaper hostels/hotels in Belize City. The place is also surrounded by barbed wire so you knew you were safe – for anything! We checked in around 9ish and were shown to our room. It was simple and clean. We even had a tv with satellite! Since I had just drank an entire sippy cup of rum punch, I had to pee like no tomorrow. I opened the bathroom door, turned on the light, and watched a giant cockroach crawl through the sink. I immediately shut the door, walked back to tell Lindsay, and then went back and peed. I never saw the cockroach again. I passed out early and slept like a baby all night. 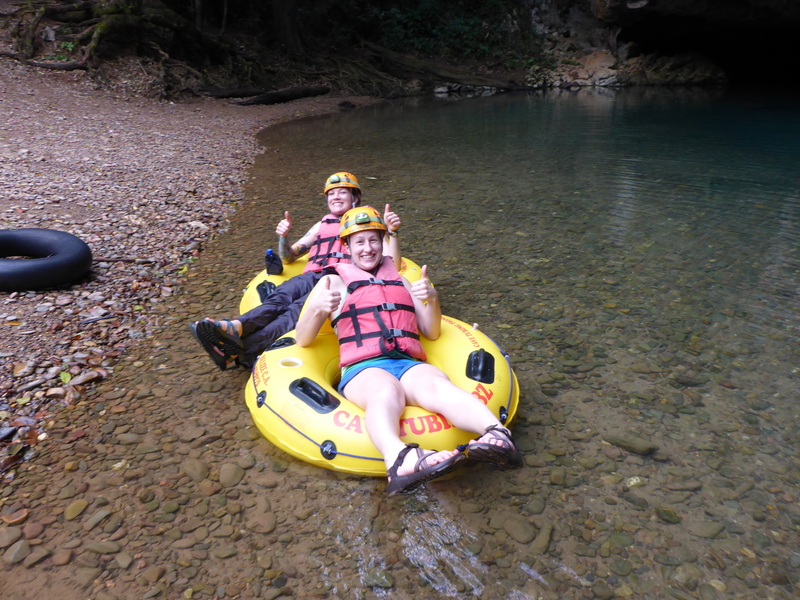 Stay tuned for a more detailed post on cave tubing next week!